Taking a shower is a natural part of our day. Whether you’re the type to do it in the morning or the evening, you can’t argue that the ritual is integral to your routine and helps you feel refreshed and ready to take on life’s challenges. Because taking a shower is such an essential part of our lives, it’s imperative that we have the right shower head to make the experience much more enjoyable. Even if you’re utilitarian with your methods, it’s best to have a shower head that will allow you to maximize every second you’re in there. Today we’re going to be looking at the best dual shower heads. These models are perfect for both speedy and sluggish shower takers as they enable you to wash yourself as thoroughly as necessary with the convenience you deserve. Let’s see how they can transform your cleaning routine. When picking out a dual showerhead, the primary benefit of this type of setup is that you can choose which mode works best for you. You can either use the standard head that remains fixed in one place, or you can utilize the body wand to get a more comprehensive cleaning experience. In this case, the showerhead from AquaDance is ideally suited for people who want a spa-level shower at an affordable price. The first thing that we like about this dual head is that both of them are seven inches in diameter. The size of them means that you can get a rainfall setting that adds an extra bit of luxury and decadence to your shower. It’s a fully immersive experience, especially when you have both heads running at the same time. To switch back and forth, there is a water regulator valve in the base of the unit. This valve has three settings to allow you to utilize one or both heads at once, giving you additional flexibility and convenience while you’re in the shower. To add even more luxury, each head has its own knob that enables you to choose between six different spray settings. You can get options like massage and pulsating water, as well as a water-saving mode that helps you cut down on your utility bills. No matter how refreshing a waterfall-like shower can be, it will add up if you’re not careful. Finally, the durability and reliability of this dual head are incredible. They are both made of stainless steel with a chrome finish, thus ensuring that they won’t corrode or wear down too easily. Not only that, but the jets are easy to clean as well - simply wipe them and remove any limescale deposits that may be present. Best of all, you don’t need a plumber to install this head onto your shower. In fact, you don’t even need any tools, allowing you to upgrade at your convenience. Although having two shower heads adds an extra layer of cleaning power and convenience to your shower routine, the issue with most of these installations is that they can be quite bulky. Yes, it’s nice that you can clean yourself faster and more thoroughly, but if you have a small shower to begin with, these kinds of showerheads can seem more intrusive than they should be. Fortunately, if you’re looking to save space, then this 2-in-1 showerhead from Delta is the perfect accessory. Even if you have ample room in your shower, it’s sleek, integrated design can elevate the appearance of your bathroom regardless of any practicality it may serve. The way that this head works is that the handheld portion snaps into the central unit. This means that you can use both of them to get a rainfall experience, or you can separate them and get water coming out of each head. The snap mechanism is fast and reliable so that you don’t have to worry about the handheld part falling out easily. One thing about this showerhead is that it’s mostly designed for massaging and relaxation. Out of the five spray settings, three of them are massages, which means that you can make shower time as luxurious and comforting as you like. Also, this head has a pause feature, which enables you to lather up or save water when you need it without sacrificing water temperature or pressure in the process. Cleaning this showerhead is a breeze, thanks to the soft rubber nozzles. Because they aren’t made of metal, you don’t have to worry as much about calcium deposits or limescale buildup. Even if it does appear, you can just wipe it off with minimal effort. Overall, this 2-in-1 dual showerhead is the perfect way to make your shower as enjoyable and economical as possible. While the Delta 2-in-1 Showerhead above is designed for those who need economy of space, this unit from Mariner is built for the opposite system. If you have a larger shower that isn’t constrained by typical barriers, then you may appreciate having the flexibility and luxurious accommodations of this two-head system. With most dual showerheads, both parts are attached to the same base. In this case, however, the handheld part connects to a separate shower bar that installs into the wall. The benefit of having this bar is that you can slide the head into position, offering more flexibility without having to use your hand the whole time. The construction of this system is incredible. Each piece is made of stainless steel, and they come with a polished, brushed metal finish. The coating ensures that they stay in pristine condition for longer, and it elevates the appearance of the showerheads as well. To make cleanup and maintenance as easy as possible, the faces on each head are made of durable plastic. This ensures that they don’t corrode or develop calcium or limescale buildup, and it enables you to clean them much more easily. Overall, if you like the idea of having a luxurious and spacious dual showerhead that is as elegant as it is practical, then you will love this model from Mariner. That being said, if you do have a small, enclosed shower, you won’t want to sacrifice as much space as is required by this installation. Text hSo far, we’ve been looking at dual showerheads that come with a fixed unit and a handheld one. For most people, this kind of flexibility and versatility is a significant part of the appeal. However, if you prefer to have dual fixed heads, then you will want something like this model from Neptune. In this case, the two heads are connected by a water diverter. Unlike other units that allow you to divert water from one head to the other, this one doesn’t have a regulator in between. Simply put, when you turn the water on, you’ll be blasted with both heads simultaneously. That being said, because of their proximity to each other, there’s no reason to try and switch between the two anyway. Although these heads are fixed in place, they each have a ball joint so that you can swivel them as needed. Thus, you can create a crisscross spray pattern or have one point up while the other points down for a rainfall type experience. Each head has three spray settings, from water-saving mode to full pressure massage. You can operate each one independently as well to ensure that you get the right mixture of pressure and spray patterns. Installation of this dual head is a breeze - you shouldn’t need any tools besides a wrench for tightening. The construction of the pieces is excellent enough that they will last for years to come. The faces of each head are made of plastic to ensure that they don’t corrode or develop buildup over time. A chrome finish keeps them from rusting as well. If you liked the idea of having a shower bar that enabled you to adjust the height of the handheld showerhead but you didn’t want to have to install a separate piece to get that level of flexibility, you will appreciate having this dual showerhead from Lordear. Unlike the unit from Mariner, this one is much more compact and will fit in both showers that have space and those that don’t. The setup for this system is such that the shower bar sits directly beneath the fixture. This means that you can raise or lower the handheld head as needed, as well as remove it to help wash the rest of your body. What we like most about this system is that it’s super easy to install. With something like the Mariner Dual Showerhead, you have to mount the shower bar into a stud to ensure that it won’t rip out. In this case, however, all it takes is a heavy-duty suction cup, and you’re ready to go in seconds. You don’t need to be an expert handyman to get this showerhead installed, making it a viable option for almost anyone. Each head comes with five spray functions to give you a spa-quality experience. To help them be as low-maintenance as possible, they come with a chrome finish to prevent corrosion, and the faces have rubber nozzles so that calcium or limescale buildup is never an issue. Overall, if you want added versatility without having to take up a ton of room in your shower, you will appreciate everything that this dual showerhead has to offer. Although having a dual showerhead can make your cleaning experience more enjoyable, one downside is that you tend to use a lot more water. Because most of us want high-pressure showers to feel clean, our water bills can start to add up once we begin utilizing two heads instead of one. Fortunately, if you’re into water efficiency, there’s this dual combo from Ana Bath. Unlike most other units, it has a flow rate of 2.31 gallons per minute, which means that you’ll use less water, even when both heads are at full blast. Yes, the pressure may be reduced as well, but it’s not so significant that you will dread using this showerhead. The heads themselves are five inches, making them ideal for rainfall and massage settings. Each one has five pattern options for versatility, and they use plastic face plates to ensure that you don’t have to worry about calcium or limescale buildup over time. 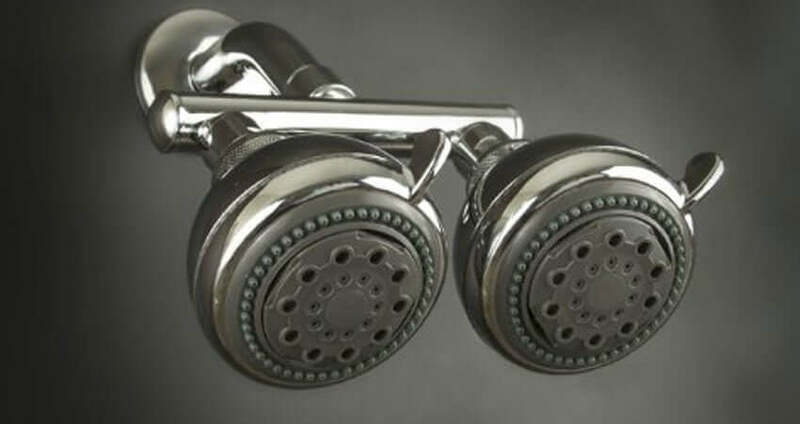 The rest of the showerhead is made of polished stainless steel to resist corrosion. For the most part, if you want a spa-like shower experience, you need a showerhead that’s both large and comes with a variety of spray settings. In this case, you get both with the HotelSpa Ultra-Luxury Dual Showerheads. One unique feature of the primary head is that it has a SpiralFlo design. This allows the water to feel more like rainfall, which adds to the luxurious feeling you get when showering with this model. As with other units we’ve seen, these heads are designed to be low maintenance. To achieve this capability, they are made of polished steel with plastic faceplates. The plastic resists calcium buildup and allows you to wipe them down quickly to avoid any messes. Overall, if you like a spa experience in the shower, this is an excellent choice for you. So far, we’ve been looking at dual showerheads that offer both luxury and practicality while cleaning yourself. However, if you want to add a bit of whimsy to the experience, then you may prefer to get something like this dual showerhead set from Luminex. What sets this unit apart from the rest is that it comes with a water-pressure activated LED lighting system. It will automatically cycle through seven different colors while you shower, adding a sense of style and entertainment to your cleaning process. With that in mind, be sure that you really appreciate the benefit that these colored lights can provide. Because they are activated by water pressure (as opposed to wires or a battery), that means they will be operating every time the shower is on. Thus, if you want to take a light-free shower, you’re out of luck. Beyond the lights themselves, these showerheads also come with an AirJet design to improve the overall pressure and flow of the water while you’re in the shower. This system adds air to the water while it sprays, making it work better than most other showerheads we’ve seen. Other features include plastic faces to resist corrosion, a flow rate of 2.5 gallons, and a flexible five-foot stainless steel hose for versatility. Overall, if you like the idea of lights in your shower, you will love this unit. We’ve seen a lot of spa-like showerheads on this list, but this model from DreamSpa has to be the most luxurious. What sets it apart from the pack is that it comes with a massive seven-inch showerhead, as well as an abundance of spray settings and durable construction. For the most part, these showerheads are not full of unique features, but they provide the same level of comfort and reliability that you would expect. They are made of chrome-polished steel to prevent corrosion, and the whole unit is super easy to install. Overall, if you like a luxury shower experience, this is the dual head to get. Text We started this list with a set of AquaDance Showerheads, so it’s only fitting that we end our list with another model. This is the four-inch model, meaning that it’s ideal for those with small showers that have limited space in which to move around. Otherwise, the quality and reliability are the same. These heads are made of polished chrome steel. They come with rubber nozzles to allow for easy cleaning, and they have six spray settings to add to the level of versatility offered. You can use both heads at the same time, and the whole unit has a flow rate of 2.5 gallons per minute. Having a dual showerhead can instantly upgrade your bathroom experience, but how can you be sure that you’re getting the best value? We’ve seen a lot of high-quality models on this list, but our top two picks are either the Delta In2ition or the DreamSpa Rainfall Showerheads. We appreciate the style and economy of the In2ition because it allows almost anyone to have a two-in-one showerhead, regardless of how much room they have to spare. For those with cramped showers, this setup is a significant benefit. With the DreamSpa Showerhead, we like that they are oversized and that they provide a luxurious spa-like experience. Bigger heads mean better coverage and a more enjoyable shower, so you can feel like you’re getting the platinum package without paying the higher price. Best Water Softener System in – Tested & Reviewed!